The first episode without MC Jun Hyun Moo aired on March 15 where all the cast members struggle without their leader. MBC’s entertainment reality TV program, I Live Alone has been airing every week since March 2013 where cast members and guests view and comment about the current episode. Known for having popular guests (e.g. idols, actors) appear on the show in addition to the hilarious scenes from the cast members, I Live Alone is recognized to be one of the most popular variety shows in Korea. Even MBC’s Omniscient Interviewing View can be said to derived from this show. Former MC Jun Hyun Moo became familiar with his girlfriend model Han Hye Jin while filming on this show in 2017. The couple announced their breakup and temporary leave from the show last month. The opening scene shows only Park Narae and Gian84 in the studio. As the 2 members worry how they will carry on the show, cut to Sung Hoon and Lee Si Eun joining them to offer some support during this crisis. This week’s episode showed ‘The Idiots’ minus Henry in Hong Kong. The 3 men explore a market where maknae Kian84 goes a little crazy buying various things. All the commentators back at the studio ask Kian84 why he suddenly bought so many things given he’s known to be a scrooge. According to Lee Si Eun, Kian84 recently bought a used car that had 200,000 miles very cheaply. But within a week of buying that used car, it broke down so now it’s in a shop called ‘I’m sick’. After shopping and eating at the market, the ‘3 idiots’ head to their accommodations for the night. Lee Si Eun aka Captain Idiot is responsible for making the reservations tells his brothers to look forward to the ‘Iron Man Room’. Amid everyone’s expectations, the room turns out to…not be themed out in ‘Iron Man’ . 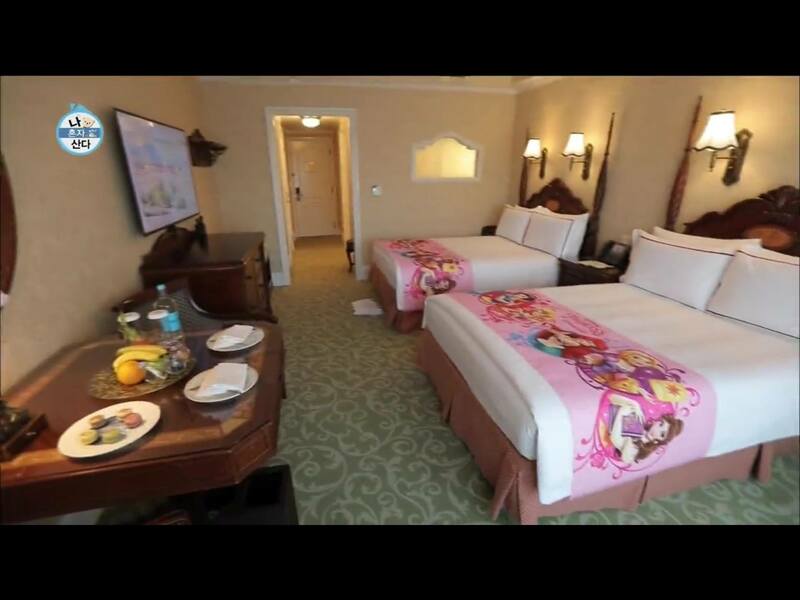 But instead cute and lovely room for princesses aka Disney princesses theme! 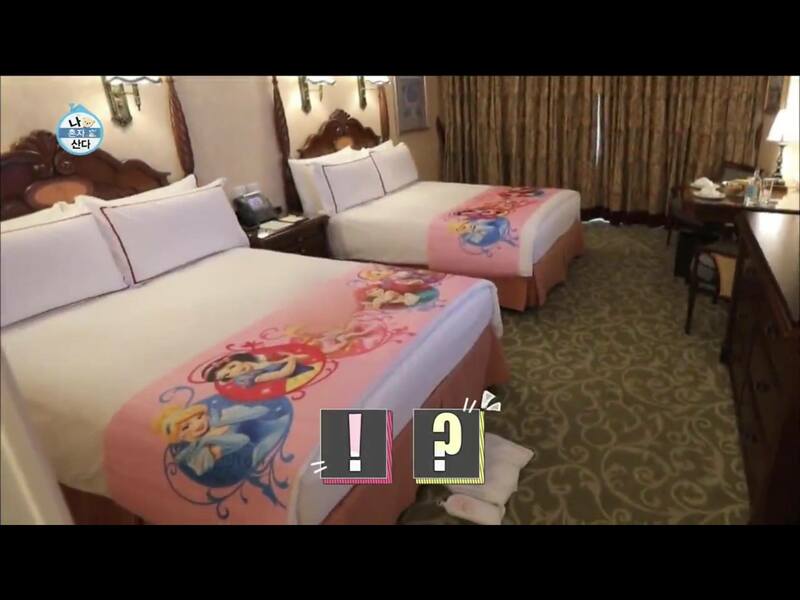 Lee Si Eun apologizes for his confusion, apparently when he made the reservations he got his english words mixed up, “Iron Man”, “prince and princess.” The 3 idiots look at the 2 princess beds and try to decide who’s going to sleep on the floor. Hence, the pool battle commences. Gian84 tries to copy everything Sung Hoon hyung does since its cool, Sung Hoon gets challenged to various games in the pool. Not surprisingly, Sung Hoon wins (former professional swimmer). Park Narae is astonished at the mix up asking Lee Si Eun to regurgitate the chocolate he just ate. 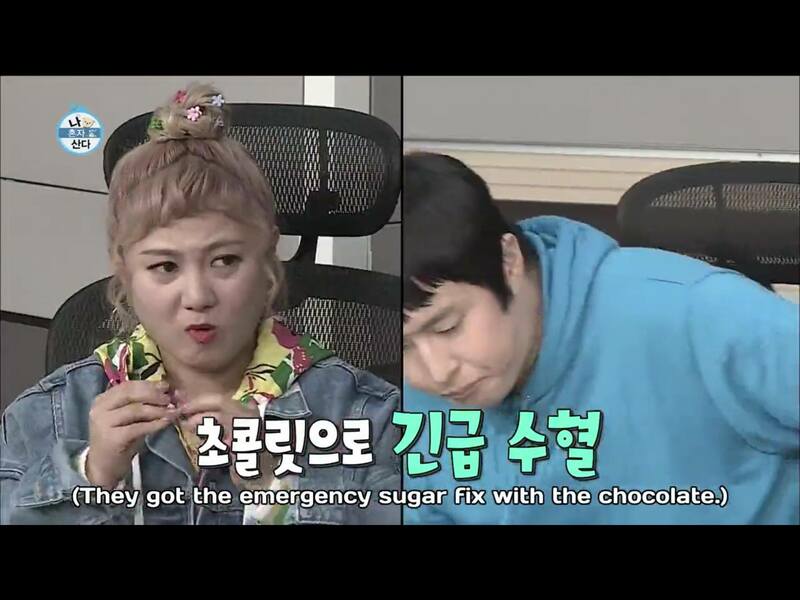 Apparently the staff of the show were really worried with two people no longer present, they gave the commenters chocolate for the first time ever to get some energy. From the beginning of this episode, Park Narae tries her best to fill the empty space left by Jun Hyun Moo. Unfortunately, even when Park Narae says something that’s sort of common sense, the other commentators aren’t able to react since they don’t know what’s the correct answer to everyone’s disappointment. The cast members are clearly trying to end it on an optimistic note, promising the remaining fun part of Hong Kong segment- preview shows all the idiots gathered together including Henry! And – Jessi’s guest segment!